(CNN) -- Veteran Los Angeles Lakers guard Derek Fisher has been praised by his teammates after helping the defending champions to a 91-84 victory over the Boston Celtics in the third game of the best-of-seven series NBA finals. As Lakers star Kobe Bryant's points tally began to dry up, the 35-year-old scored 11 points in the last quarter to seal victory for his team and a 2-1 series advantage. With less than a minute to go he produced a crucial layup that gave the West Coast side a seven-point lead which the Celtics could not recover from. Bryant, who finished with a team-high 29 points from 29 shots, was full of praise for Fisher -- who scored 16 in total and was mobbed by his teammates at the final whistle. "Fisher is our vocal leader, the heart and soul of this team," Bryant told the official Lakers Web site. "He's been criticized quite a bit for his age. It's a huge thrill for him and for all of us to see him come through in these moments." "I love what I do. I love helping my team win," Fisher added on his team's official Web site. "To come through tonight, again, for this team, 14 years in after so many great moments, it's always quite surreal." 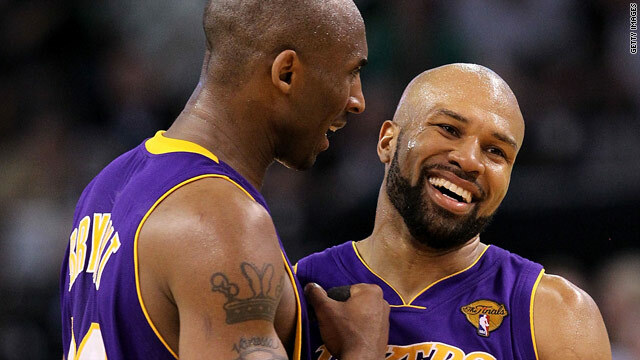 Celtics coach Doc Rivers, whose team last won the NBA title back in 2008, also admitted that Fisher's performance played a pivotal role in the Lakers win. "He was the difference in the game," Rivers told the official NBA Web site. "He's just a gutty, gritty player. He basically took the game over." Rivers' East Coast team lost the first game of the series in Los Angeles on June 3 but took home-court advantage away from the Californians, beating them in the second game on June 6. Play now remains in Boston for game four on Thursday, and the New England side will be hoping they can once again get the better of the Lakers, this time on their home court. "You can't really write the story until the next game. As a team we're just going to come out and play with a lot of energy," the Celtics' Rajon Rondo, who scored just 11 points in what was a disappointing night for his team, told the official NBA Web site. "I think we lost our composure tonight in a couple possessions and that hurt us." After two poor games, Kevin Garnett was Boston's top scorer with 25 points. But off-days from Paul Pierce and Ray Allen -- who scored an impressive 32 in game two -- allowed the Lakers to open up a lead of 12 points at halftime. The Celtics did attempt a comeback in the second half, reducing their opponents' advantage to just one, but they were not strong enough to overtake the Lakers. The Lakers are defending the title they won against Orlando last year, while the Celtics are looking to reclaim the crown they have won a record 17 times -- their last victory coming over the L.A. side in 2008.